PerryGolf™ is one of the most respected providers of golf tours and cruises to the world's most memorable destinations ranging from Scotland and Ireland to the Mediterranean, the Caribbean, New Zealand, RegisterAustralia and South Africa. We arrange every aspect of completely customized itineraries for groups of men, women and couples that combine marquee golf with sightseeing, wine tastings, safaris, luxury resorts plus golf and attendance packages to the British Open. 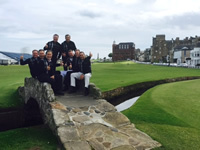 Founded by Scottish golfing brothers Gordon and Colin Dalgleish in 1984, we offer unrivalled access to guaranteed tee times at the Old Course at St Andrews along with a fleet of luxury motor coaches with concierge drivers for groups eight and larger. PerryGolf Cruising™ offers all-inclusive voyages beginning in January to the Caribbean, New Zealand and Australia; followed by the British Isles including Sunday attendance to The Open plus the Baltic Sea and the Mediterranean during the summer and fall. We sail with three different cruises lines; the 690-guest oceaner of Azamara Club Cruises plus the 112-guest mega-yachts of Sea Dream Yacht and the 8-16 guest hotel barges of European Waterways which produces a portfolio with the most choices. Air Travel Services - PerryGolf is unusual among many golf tour operators for providing complete air travel assistance. Better still, were are frequently in position to negotiate usually attractive fares with our Preferred Carriers. Click here for a sample of our current fares to Edinburgh and Shannon. Whether you, or you and your wife, travel with Members and or you simply recommend our help we will be pleased to partner in two ways. (A) When you travel with seven of your Members - to the British Isles or any other of our twelve destinations - our rewards program will comp the complete schedule of land arrangements AND provide funds for your own airfare, caddie fees and out-of-pocket expenses. For example, a group of seven Members traveling with you and paying $5,000 each for their land arrangements would produce $2,450 – 7% of group’s total booking excluding airfare – for you to spend as you please. The only requirement is for each Member's land or cruise spending to be at least $4,200. (B) When you lead your Members (7 paid cabins / 14 passengers) on a PerryGolf Cruise with Azamara or SeaDream, our rewards program will comp your entire cruise fare and golf arrangements, plus we’ll comp the cruise fare for your spouse and offer a 25% discount on the golf package if desired. We’ll also cover all taxes and port fees. Obviously you can’t travel with all your Members but every time you introduce us to a Member who books we'll return the favor with a 5% Introduction Reward. Your reward will be calculated on the total booking value excluding airfare whether everyone in the group is your Member or not. We ask that you document the referral with an introduction emailed to Information@PerryGolf.com in advance of our contact with your Member. From that point, you can be involved as much or as little as you like. The first is how we are uniquely qualified to provide a complete and trusted experience for everyone at your club – men, women and couples – Golfers and Non-Golfers alike. 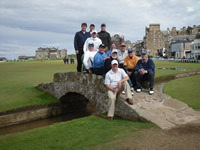 The second is how member golf travel can align you with influential people while everyone has the time of their lives! I invite you to contact me at any time.